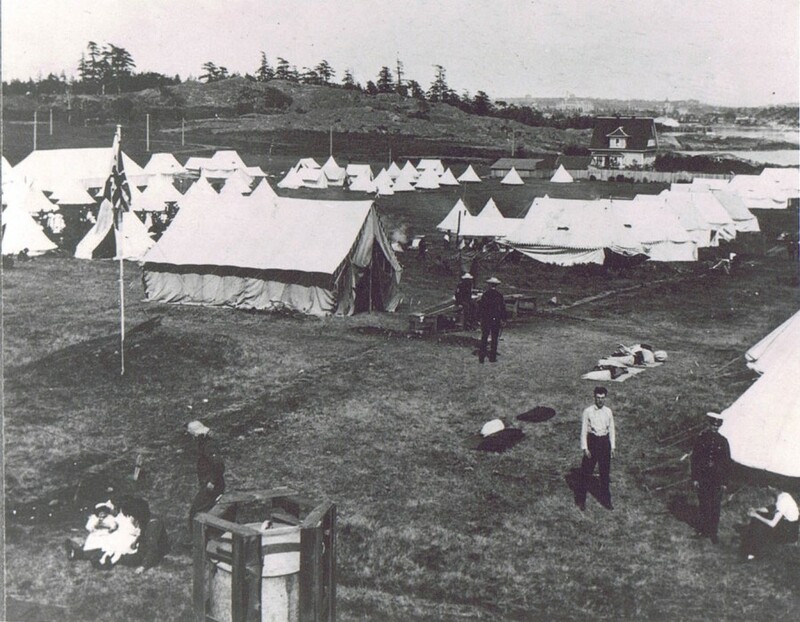 A scene from a militia camp at Macaulay Point. Courtesy of Craig Cotter at the Museum of the 5th (BC) Regiment Royal Canadian Artillery. This unfortunate state of affairs began to change as the nineteenth century came to an end. From the late 1890s to the outbreak of the First World War, the residents of Victoria started to take an unprecedented interest in the state of their city’s militia. This new enthusiasm was inspired by a variety of recent political developments and powerful personal sentiments, including concern over the increasingly aggressive stance and military expansion of Imperial Germany, personal ties to Great Britain, and the pride that Victorians felt in both the martial prowess of the young Dominion, demonstrated during the campaigns of the Boer War, and the incredible economic and demographic boom that was taking place in British Columbia at that time. The province and its capital had entered an “age of confidence,” and so too did its militia, which expanded rapidly during these years. In addition to the gunners of the 5th Regiment, the city gained two infantry units. The first to be formed was the 88th Regiment, Victoria Fusiliers, established on September 3, 1912. The second, the 50th Regiment of Foot, Gordon Highlanders of Canada, was created on August 15th, 1913, equipped out of the pockets of Victoria’s proud Scottish community. During these years, the militia was not only growing, but evolving. In earlier times, militia units had had to focus primarily upon the social aspect of their activities, providing a variety of recreational opportunities in the hopes of attracting and keeping recruits. The events of the Boer War prompted a significant change. The glorious successes of Canadian troops at famous battles like Paardeberg and Leliefontein sent a wave of enthusiasm for all things military sweeping across the country, and caused militia enthusiasts to rethink how the nation’s volunteer forces were trained. Victoria’s militiamen were soon spending their yearly twelve-day training camp taking part in more elaborate and practical exercises, such as orchestrating the defence of the forts of Esquimalt or other local landmarks. It was during these exercises that Arthur Currie, the future Commander of the Canadian Corps, received his first experience of command in the field. 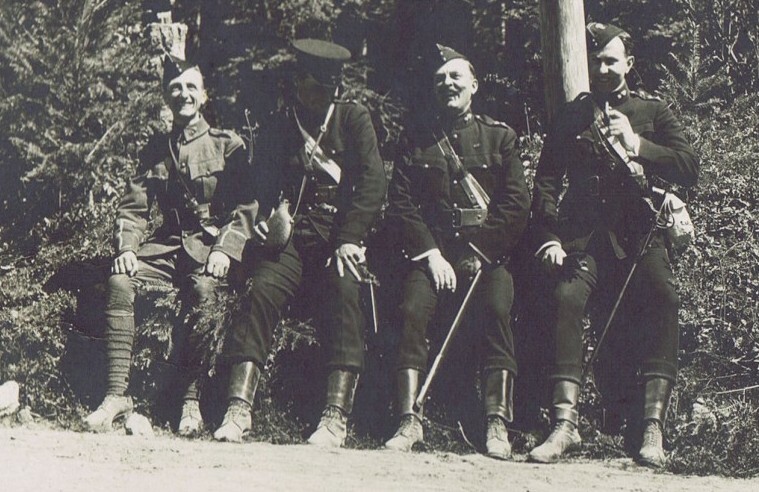 Arthur Currie (far right) and friends enjoying a break on 4 Mile Hill, View Royal. Courtesy of Craig Cotter at the Museum of the 5th (BC) Regiment Royal Canadian Artillery. Currie and his fellow citizen soldiers were only called upon to make use of this military training on one occasion during these years. In the summer of 1913, Victoria’s militiamen were sent up island to Extension, near Nanaimo, to put down a destructive miners’ strike. The worst was over by the time the militia arrived, leaving the strike-breaking force to track down suspected rioters and clean up an astounding amount of property damage. Besides their increasingly advanced military training, Victoria’s citizen soldiers participated in a variety of ceremonial duties and social pursuits. It was common practice for officers to buy their men a round or two of drinks at the end of a training day. Militiamen also socialized over meals in the regimental mess.Occasionally, they would have the honour of guarding visiting dignitaries or attending prestigious events. Local gunners and infantrymen also participated in local, national, and international competitions, winning awards in everything from tug of war to marksmanship. A good showing at these tournaments enhanced a unit’s reputation, and excited even greater interest in the militia, as did parades, band performances, and sports matches between regimental and civilian teams. In these golden days, Victoria’s citizen soldiers enjoyed a new prominence in their community, and became a greater part of the city’s social life than ever before. 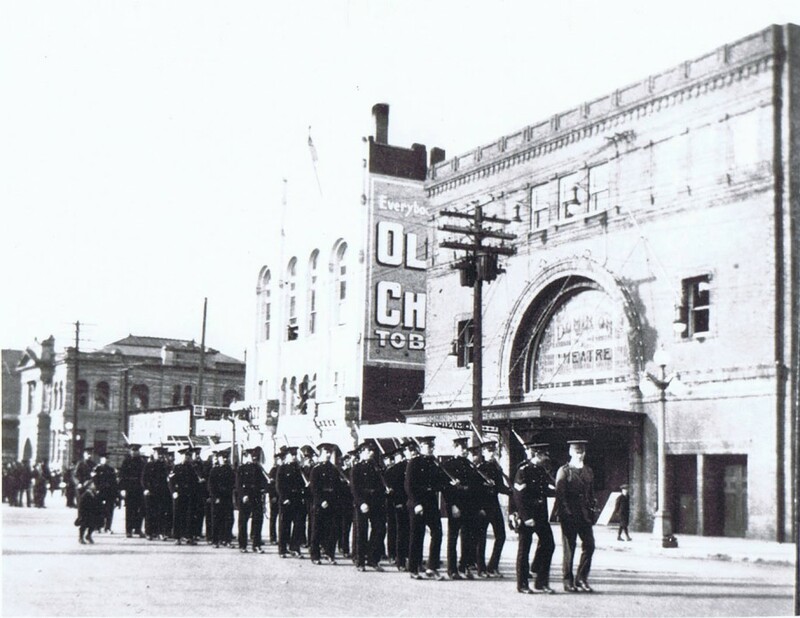 The 5th Regiment on parade in downtown Victoria. Courtesy of Craig Cotter at the Museum of the 5th (BC) Regiment Royal Canadian Artillery. Yet dark clouds were gathering on the horizon. When the storm broke and war began in Europe, local units responded quickly. They had already been preparing for a couple of days, organizing the city’s defenses and putting together lists of volunteers for overseas service. Detachments of militiamen soon reported for duty at Victoria’s coastal batteries and forts. Others patrolled the training grounds at Willows Camp, or guarded the residences of local officials and “vulnerable points” that might be targeted for sabotage, such as railway bridges, the dockyards of Esquimalt, fuel and ordinance supplies, and the telegraph cable station at Bamfield. Over the next four years, the city’s militia forces continued to train, man Victoria’s defences, and supply recruits for units of the Canadian Expeditionary Force that were assembling at Willows Camp. Whether they served at home or overseas, the conflict in Europe impacted each and every one of them – and the institution to which they belonged. Volunteers from the 5th Regiment leaving for Petawawa as part of the 15th Brigade Canadian Field Artillery. Original notes name them, from left to right, as Ross, Pellow, Patterson, Christensen, and Ware. Courtesy of Craig Cotter at the Museum of the 5th (BC) Regiment Royal Canadian Artillery. James A. Wood, “Social Club or Martial Pursuit? The BC Militia Before the First World War,” BC Studies 173 (Spring 2012), n.p. For an example of how Victorian militiamen viewed their service during this period, we can turn to a letter written by Arthur Currie, sent to his old regiment, the 5th (BC) CGA on March 13, 1924: “On many occasions in Canada’s brief history the worth and usefulness of the Militia have been strikingly demonstrated. All patriotic citizens should give it the fullest measure of support. It is their duty to do so, while it is the duty of those who belong to our forces to take their work seriously and make themselves efficient and ready to play a man’s part if the need should ever again arise.” This letter is reproduced in full in F.A. Roberton’s 5th (B.C.) Regiment, Canadian Garrison Artillery and Early Defence of the B.C. Coast: Historical Records, 181-182. “Report on the State of the Militia of the Dominion of Canada for the Year 1880,” Sessional Papers, 1881, 67, quoted in James A. Wood, “Social Club or Martial Pursuit?,” n.p. “Report on the State of the Militia of the Dominion of Canada for the Year 1881,” Sessional Papers, 1882, 62-63, quoted in James A. Wood, “Social Club or Martial Pursuit?,” n.p. R. H. Roy, Sinews of Steel: The History of the British Columbia Dragoons (Kelowna: The Whizzbang Association, 1965), 35, quoted in James A. Wood, “Social Club or Martial Pursuit?,” n.p. Jack Bates, “The 88th Regiment (Victoria Fusiliers),” CFB Esquimalt Naval and Military Museum, http://www.navalandmilitarymuseum.org/resource_pages/coastal_defence/vicreg.html. “The History of the Canadian Scottish Regiment (Princess Mary’s),” National Department of Defence, http://www.canadianscottishregiment.ca/index.php?page_id=1024. James Wood, Militia Myths: Ideas of the Canadian Citizen Soldier, 1896-1921, (Vancouver: UBC Press, 2010), 80-102. 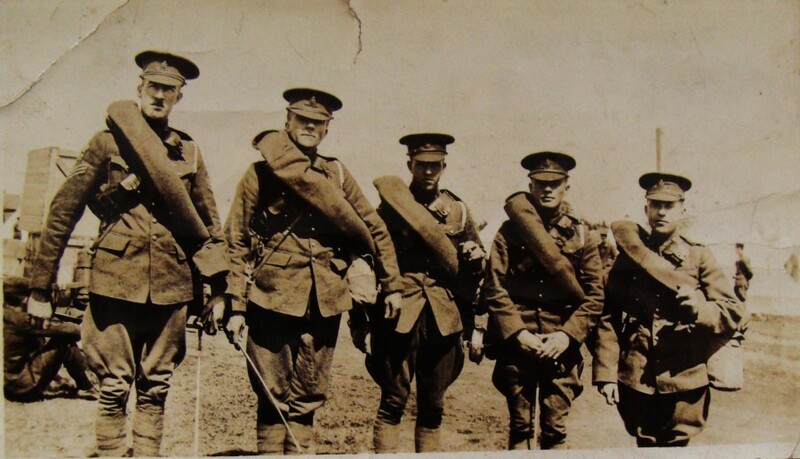 For more information on Currie’s time with the 5th Regiment, see F.A. Roberton’s 5th (B.C.) Regiment, Canadian Garrison Artillery and Early Defence of the B.C. Coast: Historical Records, (1925), 116-118 and “Sir Arthur Currie,” Museum of the 5th (BC) Regiment Royal Canadian Artillery. Robertson’s book was never published; it is available through the Museum of the 5th Regiment. F.A. Roberton, 5th (B.C.) Regiment, Canadian Garrison Artillery and Early Defence of the B.C. Coast: Historical Records, (1925), 182. “Victoria’s Basketball History,” Greater Victoria Sports Hall of Fame. James A. Wood, “Social Club or Martial Pursuit?,” n.p. See “Orders and Duties for 88th Regiment Victoria Fusiliers” and the photo archive of the 5th Regiment, and the oral history of John S. Adam, interviewed by Chris Bell, August 24, 1982, Dr. Reginald H. Roy Collection of Interviews, University of Victoria Special Collections, 21:00. F.A. Robertson, 5th (B.C.) Regiment, Canadian Garrison Artillery and Early Defence of the B.C. Coast: Historical Records, 177.